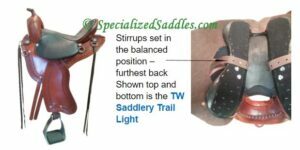 All Specialized Saddles feature adjustable stirrup positioning which allows the rider to put the stirrups in the ideal position for their body. The stirrups can be placed in forward, centered or balanced position. Dave Kaden explains some discipline specific stirrup positioning in the below video. Right under the video you will find specific information on how to adjust your stirrups. Try riding with the set screw in the forward, balanced, and centered positions to find which is most comfortable for you. If you experience the feeling of tipping of falling forward place the set screws in the most forward position to alleviate this. If you feel like you cannot get your legs under you, place the set screw in the balanced or centered position to alleviate this. 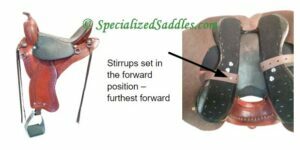 Without set screws it allows stirrup leathers to move forward and back when riding. This can be helpful when going up and down hills and lets you move forward and back as needed.